We want everyone to feel welcome in our school restaurant. We work actively to promote a healthy lifestyle and healthy, nutritious food is a part of this. How and what we eat affect our whole existence. It controls our well-being, our growth and above all our performance. We want to create healthy appetite for what we serve and to ensure this we have our excellent chefs, of which one is our Food & Nutrition Manager, Ulrika Eichler, with many years experience from working in restaurant kitchens. Every day the students and staff can choose from different lunch alternatives including homemade soup that tastes just as delicious as it smells. Crisp bread with butter is always included. We also make all vegetarian and lactose free food in our own kitchen. We use locally produced and organic produce as much as possible. Our meat, poultry, egg, potatoes and vegetables are from local farms, from suppliers such as “Bondens Skafferi” and “Rötter”. The fish we serve we get from Lomma, just north of Malmö. We take great care ensuring that the food looks appetizing and that it contains all nutrients. We always cook our food with the healthy and tasty olive or rapeseed oil. 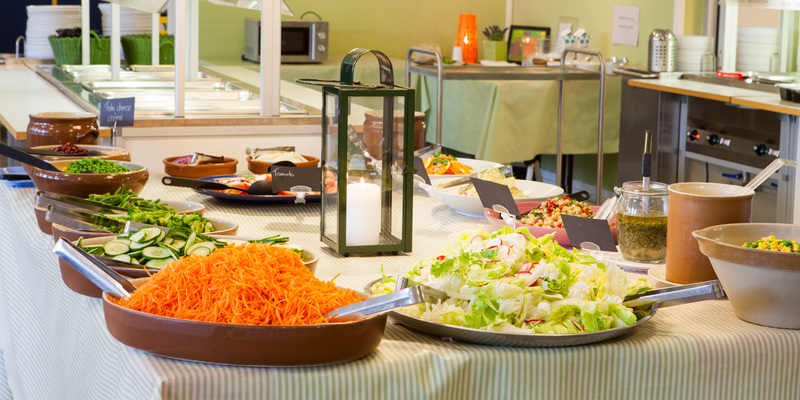 We also have a large salad buffet that we are particularly proud of. It includes most vegetables and often reflects the seasons. For the afternoon snack served to the students attending After School Care, we often bake our own leavened bread – filled with fibers and other wholesome products. We also serve our homemade muesli with milk or sour milk as well as fruit and vegetables. Welcome to the Bladins School Restaurant! Scanian beef stew (locally produced meat) . Served with boiled potatoes and pickled beets.